See, those who have followed me for the past few years know that I covered Open Mike Eagle's Dark Comedy in 2014 - so much so that it landed on my year end list of my favourite records of that years at #3. And really, that record gets better every single time I hear it: a glitchy, frequently funny, often heartbreaking hip-hop record with so much unique wordplay and thought-provoking ideas that it showed Open Mike Eagle at the top of his game. And yet even though I really loved that project, I kind of missed both of the projects he dropped in 2015. The first is a little more explainable - A Special Episode Of was an EP, I don't normally cover EPs, and while I did hear it and thought it was really solid, it wasn't really something that captured my attention in the same way Dark Comedy did, and I've always felt that Open Mike Eagle's thoughts are best expressed on fully formed albums rather than short form. The second project is a little less explicable - a collaboration with Serengeti under the name Cavanaugh, something that just slid through the cracks at the end of the year with mostly positive reviews. 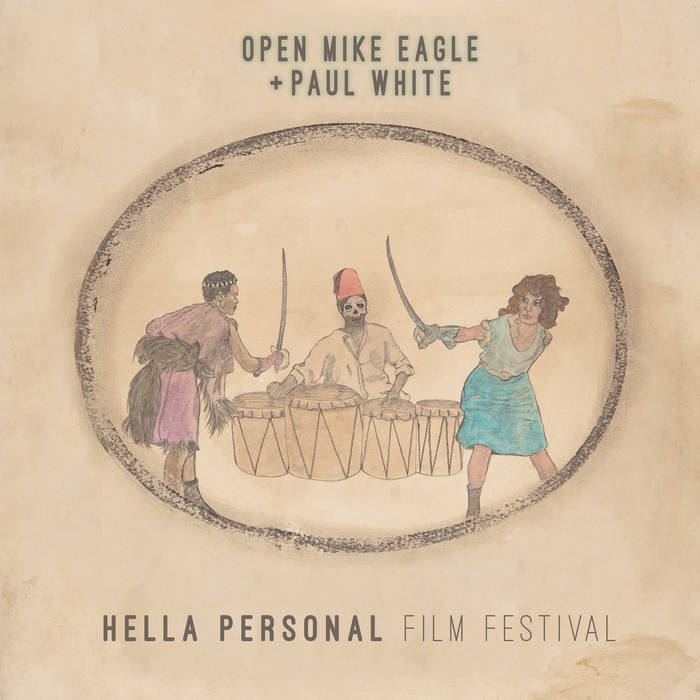 But I'm not missing out this time and even though this is also a collaboration project, it strikes me as a little more of a traditional Open Mike Eagle project, as Paul White is a UK-based producer known for working with Danny Brown that handles the majority of the production here. And considering the sound was reportedly more sample driven and soulful - and yet of course still containing that glitchiness you'd expect from Open Mike Eagle that seems to characterize his anxious neuroses - I wondered how well a greater focus on melody would complement Open Mike Eagle's occasionally sing-song rapping cadence. Either way, a blend of old-school sounds and progressive hip-hop is right up my alley, so I dug deep into Hella Personal Film Festival - what did I get? Well, all the more proof that I need to be watching out more carefully, because Open Mike Eagle easily delivered one of the most thought-provoking, fascinatingly produced, genuinely insightful, and heartbreakingly personal records you'll hear this year. Like Open Mike Eagle's Dark Comedy it's a many-layered exploration of ego and a rapper who seems distinctly uncomfortable in the limelight, but Hella Personal Film Festival is a natural outgrowth beyond the jokes to more straightforward insight and questions that have no clear or easy answers. Oh, and it should go without saying that it's easily one of the best projects of the year, especially in terms of how well the production and lyrical ideas hold together to form some powerful parallels across this record. Now before we dive deeply here - and believe me, this review will go deep - we need to start with Paul White's production. Partially drenched in 70s soul and funk and full of quirky little samples, it's much more organic and smooth that the normal frigid, glitchy elements that normally define Open Mike Eagle's sound - although make no mistake, those elements do come in, perpetuating that feel of unease that something isn't quite as right as it might seem. Initially I was reminded a bit of Ariel Pink in the organic mishmash of samples, borderline chintzy pop culture ephemera, and surprisingly potent grooves, but Paul White is playing things with a little more composition, albeit barely. This is a record about putting forward smiles and happiness against the yawning pit of anxiety within, and as such he goes for the little details to perpetuate the image. The liquid funk of 'Admitting The Endorphin Addiction' that expands so well into the bright flourishes of keys and the daytime talk-show-esque horn line on 'I Went Outside Today', the feigned confidence against the underlying neuroses. And it manifests so well in the glitchy normality of 'Check to Check', the jaunty piano, whistle and sax on 'The Curse of Hypervigilance', the choppy soul of 'Insecurity' that'll later become piano-accented with a percussion element that sounds like shards of broken glass roiling together on its second part later on the record. And then there are the shifts that are just bizarre, like the shrill blend of harmonica, chipmunk vocals, a sparse beat and bells on 'Smiling (Quirky Race Doc)' that might be the only time I've ever thought the chipmunk vocal actually worked for me, or the oddly pompous vibrating bass and gruff chorus of 'Protectors Of The Heat', or the genuine melancholy of 'Dive Bar Support Group', the ode to lonely dive bars with the awkward bass groove and the hook that wouldn't be out of place from any Brooklyn indie pop hipster. And that's before the ending of the album ends in a sodden pool of alcohol, first with hints of funk that mirror the album's beginning before dissolving on the closer into a heap of brushed cymbals, sci-fi whirring, and a dreary, dirty beat. And all of it fits, not just through some phenomenal lyrical transitions and parallels, but the fact that Paul White and Open Mike Eagle play to a knack for real melodic hooks and textures that feel like a fully formed fusion of their styles - hell, the parts I probably liked least are when they got a little too messy, like the hyper-compressed guitar looping on 'Dang Is Invincible' or the warping shrillness of 'Leave People Alone', and even then the content, samples and Open Mike Eagle were both enough to keep things interesting! On that note, let's talk about Open Mike Eagle himself, who actually puts himself through one hell of a performance here. I've always had a fondness for his plainspoken yet off-beat and melodic rapping style, with interesting rhyme patterns that manage to remain consistent, but grabbed me more was his delivery of that content. This is a record that requires a very difficult balance, from the opening album where he's playing towards confidence and excitement that we as the audience are at least partially aware is a put-on, to the moments of anxiety on both 'Insecurity' tracks, the former where he wants his girl to give him the truth before trying to police her tone and then telling her to outright lie, and then later when dinner with a friend gets complicated as he overcompensates for the new friend's arrival. It's intentional social awkwardness, and it's such a difficult balance to draw our empathy at these events while still framing the situation that something isn't quite right all the way through. Similar case for the messy drunkenness of the album's ending - mirroring the confidence of the opening tracks, but this time propped up on alcoholic delusions that eventually have to collapse in up on themselves. And while much of this plays to similar types of sadsack comedy Open Mike Eagle has explored before, this time the framing and situations are more mundane, more tightly focused, and as such much more relatable - and yet incredibly tricky to pull off without becoming a caricature. Because make no mistake, when you start looking at the themes and ideas behind this record, caricature is the last thing you want, if only because there's such a richly emotive humanity behind it, a black man trying so damn hard to put forward his work and art as an artist in a world that'd seek to snap back on his ego or crush him passively. One thing to note immediately is that this a record that deals in cycles, further emphasizing the smaller scope of the story to the day by day, almost to the point you could see an 'arc' of sorts. He starts off craving the rush of life and endorphins so he emerges into the world to coast off that natural high... and almost immediately you see how it's internally propped up on little pleasures, to the point where ignoring a Lena Dunham quote is a source of great relief - a line, for the record, I absolutely loved, even as a fan of her HBO series Girls. Aesop Rock delivers an typically impenetrable guest verse here that mirrors that same ego, which hits an apex on 'Dang Is Invincible', where he's almost questioning whether he should feel bad for feeling so good about himself... and yet then you get the picture of how fragile that ego is. 'Check To Check' shows how such self-worth is often inflated by technology, the checks being to social media, and 'The Curse Of Hypervigilance' shows how so many of those larger social structures that might give confidence are really all so hollow when examined more closely, leading to a parade of accusations and paranoia that are really so small but are enough to feel threatening. Of course, then you have the much larger threat that materializes on 'Smiling (Quirky Race Doc)', which shows a profound loneliness as he just wishes others could share their happiness with him instead of turning away because of unconscious racially-tinged fear or condescending to overcompensate. And yet in trying to inform a track later, he himself is aware of the hypocrisy that comes with telling people to not trust the fear-mongering media or to educate themselves when so much of his own message plays to the same visceral impulses, especially when the parallels aren't leading to any real change. And from there, the record turns inwards into one of the most compelling and high-concept tracks here: 'A Short About A Guy That Dies Everyday', which takes its title character and explores not just the violent deaths but also the eternity of the situation never changing, never any stability to contemplate more time, an explicit parallel to that sense of instability that comes with being a black man in America and being fed so many conflicting messages surrounding masculinity and stereotypes that perpetuate the cycle - or, to quote him directly, "Eternity is drama making life the commercial." And then Open Mike Eagle places himself in context with it, on 'Protectors Of The Heat', where Hemlock Ernst describes a series of elitist gatekeepers of wealth and culture and opulence, social strictures that often prove just as inflexible for them... and now as Open Mike Eagle has found success and fought to break out of the world that'd confine him, he sees his voice become one with those that would shut the gates. It's an insecurity at play throughout the entire album, because he just wants to be happy and secure in his life, but where is that security or happiness coming from, a frail ego propped up on the illusion of security - or the very real security that comes with embracing stereotypes and barricading against those coming up behind him - or willfully blinding himself to truths he doesn't want to hear? After all, the burrito you eat one night to stave off the hangover - a great callback metaphor - might not work the next, and even if you do, it's still kind of tasteless. And there's no easy answer to this question - all he knows as he sinks back into the darkness at the end of this record, his confidence in constant flux - something to which the acceptance of the flip, that loss of control, seems to imply he is at least aware of what he can do - that the cycle's going to repeat the very next day, that constant search for some form of happiness and security. And while it's never guaranteed for anyone, for a black man trying to find success in America it's even shakier. In short, I don't think since Kendrick's To Pimp A Butterfly that I've found such an intelligent, intricate, and downright heartbreaking examination of what it means to be a successful black man in America, but the themes of impermanence and insecurity run just as deep and are universal to us all. And while this record does indeed get very serious, it also has great hooks and enough subtly brilliant humor that I keep finding more wit every single time. In other words, you're going to be hard-pressed to find a smarter, more cohesive, and yet subtly heartfelt record hip-hop release this year. For me, an easy 9/10 and the highest of my recommendations - rarely has an MC been able to tap into the big ideas in the little moments so brilliantly. Is there a list of samples around? I'm finding the piano on "Dive Bar Support Group" to be like an itch I can't seem to scratch. It sounds like something like "The Good Son" era Nick Cave (even if it probably isn't). Very powerful, such an interesting and informative article, it was nice to read it. Thanks to the author, you have done a terrific job!! !